Breeding Range: Alaska east across Canada and the northern U.S. to the Great Lakes region (Stout and Nuechterlein 1999). Breeding Habitat: Emergent Marsh, Inland Open Water. Nest: Platform nest often located in flooded emergent vegetation, occasionally on mats of submergent vegetation in open water (Stout and Nuechterlein 1999). Nesting Dates: Eggs: early May to early July (Robbins 1991). Foraging: Surface dives (Ehrlich et al. 1988). Habitat use during Migration: Inland Open Water, Great Lakes Open Water and also along ocean coastlines and rivers (Stout and Nuechterlein 1999). Arrival Dates: Mid-April to mid-May (Robbins 1991). Departure Dates: Late September to mid-November (Robbins 1991). Winter Range: Along both Pacific (south to central CA) and Atlantic (south to N. Carolina) coasts, occasional on Great Lakes (Stout and Nuechterlein 1999). Winter Habitat: Often along coastal bays and shorelines, sometime located well offshore; also uses inland freshwater lakes (Stout and Nuechterlein 1999). 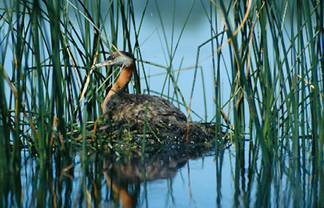 Throughout its range, the Red-necked Grebe nests in freshwater marshes and lakes with emergent vegetation. Bulrush, cattail, sedge, willow, and horsetail, as well as wild rice in some areas, are commonly used for cover and anchoring nests. The Red-necked Grebe also occasionally nests in bogs or open water areas with thick mats of submergent vegetation (Stout and Nuechterlein 1999). In Wisconsin, which is outside this species’ core breeding area, most wetlands used for nesting are shallow prairie pothole types with >25% emergent plant cover (Brooks 2006), including Rush Lake (Winnebago County), Grassy Lake (Columbia County), Lake Maria (Green Lake County), and formerly Lakes Twin and Oakridge (St. Croix County; Evrard 1988, Robbins 1991, Tessen 2000, W. Mueller, pers. obs.). Sedge marshes such as Crex Meadows State Wildlife Area also are used for nesting. A mosaic of vegetation may be important as several important nest sites contain emergent vegetation interspersed with extensive beds of submergent vegetation, such as sago pondweed and milfoil (Eichhorst 1985, Evrard 1988). Nest sites typically contain a combination of shelter from wind and waves, availability of nest materials and anchorage, easy swimming access, proximity to open water, and distance from shore bound predators. Nests often are located away from the shoreline but distances can vary from 0.6-91 m. They are built of decaying and live vegetation and are commonly located in water 20-100 cm deep. The maximum depths reflect the availability of emergent cover and nest anchorage, while minimum depths reflect requirements for swimming access (Stout and Nuechterlein 1999). Wetland size also may be important, particularly in the southern portion of its range. Red-necked Grebes rarely occupy wetlands < 2 ha in southern Canada (De Smet 1983 cited in Stout and Nuechterlein 1999) and <4 ha in Wisconsin (Gieck 1988). Wisconsin is on the extreme southeastern edge of the Red-necked Grebe’s breeding range; here it is considered a rare summer resident and rare to uncommon migrant in the state (Robbins 1991). Although it is unclear if habitat is limiting the Red-necked Grebe in Wisconsin (Gieck 1988), the widespread alteration and destruction of wetlands has likely eliminated areas of potential nesting habitat. Prior to Euro-American settlement, wetlands occupied an estimated four million hectares of the total fourteen million hectares of Wisconsin’s land area. Today, 53%, or 2.1 million hectares, of these wetland habitats remain. Agricultural drainage and urban development remain threats to wetland ecosystems and local populations of wetland-associated birds. Many inland lakes also have suffered from fluctuating water levels, proliferation of carp, increased sedimentation, and eutrophication, resulting in unsuitable nesting habitat (WDNR 2003). Strict wetland use regulations and incentive programs designed to restore or enhance wetlands have helped to curb habitat loss and protect existing wetlands (WDNR 1995). Furthermore, the Upper Mississippi River/Great Lakes Region Joint Venture has protected, enhanced, or restored more than 37,000 hectares of wetland habitat in Wisconsin. Few population data exist for the Red-necked Grebe. Although Breeding Bird Survey (BBS) data suggest a non-significant increase range-wide, BBS coverage is inadequate throughout much of its breeding range (Sauer et al. 2005). In Wisconsin, this species is at the edge of its range and likely has always been a rare breeder. Though not reflecting a survey of all potential breeding habitat, fewer than 50 adults have been counted in any one year statewide at sites regularly monitored over the past decade (S. Matteson pers. comm.). It is considered an endangered species in the state and is sensitive to human disturbances. Habitat loss resulting from drainage, filling, and lakeshore development has likely reduced Red-necked Grebe nesting opportunities in Wisconsin. Fluctuating water levels, agricultural runoff, and recreational boating also may limit nesting in some areas (Gieck 1988, WDNR 2005). Conservation efforts should focus on preventing further wetland loss and degradation and restoring wetland complexes. Wetlands managed for Red-necked Grebe should contain a mosaic of emergent and submergent vegetation, with a minimum of 25% cover of bulrush and cattail (Eichhorst 1985, Evrard 1988, Brooks 2006). Focus restoration efforts on wetlands at least 4 ha in size. Whenever feasible, manage water levels >20 cm deep and minimize water fluctuations during the nesting period (early May to early August). Additionally, reduce recreational activities or other forms of human disturbance wherever Red-necked Grebes are nesting (Gieck 1988, Stout and Nuechterlein 1999). The continuation of wetland management, protection, and restoration efforts such as the Wetlands Reserve Program, Partners for Fish and Wildlife, and North American Wetland Conservation Act will benefit this and other waterbird species. Conservation and management strategies for this species should be focused in the Southeast Glacial Plains ecological landscape (WDNR 2005). More research is needed to determine current site status and limiting factors affecting Red-necked Grebes in Wisconsin. Annual breeding surveys would provide an important index to the size and health of the population and identify new breeding areas. Basic information on the nesting ecology of Wisconsin’s population is needed, including nest building, egg laying and incubation dates, clutch size, hatching success, and causes of nest failure. More information is needed on breeding habitat characteristics and specific features associated with reproductive success. Because fluctuating water levels may result in nest failure, artificial nest platforms warrant more study (Gieck 1988). More research also is needed to delineate important migratory stopover sites and wintering areas (Stout and Nuechterlein 1999). Brooks, W. 2006. Red-necked Grebe. 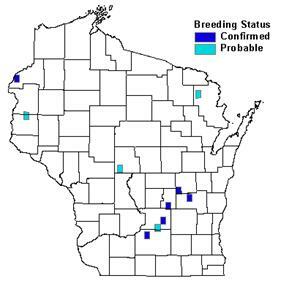 In Atlas of the Breeding Birds of Wisconsin. (N.J. Cutright, B.R. Harriman, and R.W. Howe, eds.). The Wisconsin Society for Ornithology, Inc. 602pp. De Smet, K.D. 1983. Breeding ecology and productivity of Red-necked Grebes in Turtle Mountain Provincial Park, Manitoba. M.S. thesis, Univ. of North Dakota, Grand Forks. Eichhorst, B.A. 1985. Status of the Red-necked Grebe on Rush Lake, Winnebago County, Wisconsin. Passenger Pigeon 47: 60–62. Evrard, J.O. 1988. Nesting Red-necked Grebes in St. Croix County, Wisconsin. Passenger Pigeon 50(4): 291-295. Gieck, C.M. 1988. Wisconsin Red-necked Grebe recovery plan. Wisconsin Department of Natural Resources, Bureau of Endangered Resources. Madison, WI. Hoffman, R.M. 1990. Birds of Wisconsin’s deep marshes and shallow open-water communities. Passenger Pigeon 52(3): 259-272. Mossman, M.J. 1983. The Red-necked Grebe in Wisconsin: status and preliminary survey, 1983. Wisconsin Department of Natural Resources, Bureau of Endangered Resources. Madison, WI. Stout, B. E. and G. L. Nuechterlein. 1999. Red-necked Grebe (Podiceps grisegena). In The Birds of North America, No. 465 (A. Poole and F. Gill, eds.). The Birds of North America, Inc., Philadelphia, PA.
Robbins, S.D. 1991. Wisconsin birdlife: population & distribution, past & present. Univ. of Wisconsin Press, Madison, WI. Tessen, D.D. (Ed.) 2000. Wisconsin’s favorite bird haunts. Fourth Edition. Compiled and edited by D.D. Tessen. Wisconsin Society for Ornithology, Inc. De Pere, WI.